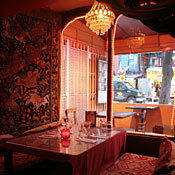 Last night I went to a restaurant/hookah lounge called Khyber Pass located on 34 St. Marks Place in the East Village. We sat in the bay window area where you walk up a few steps and basically lie down while you eat your dinner and smoke your hookah. I ordered vegetable kababs. Yum! So delicious. I have to say, my favorite kind of rice is the one the Afghanis eat. I don't know what it is but dayum that ish is good! We ordered mint flavored hookahs that made me feel like I was flying by the time I left 3 hours later. I felt like I was at one of my friend's homes here. Had my shoes off, sitting like a beached whale at the "table" relaxing. It was fab! 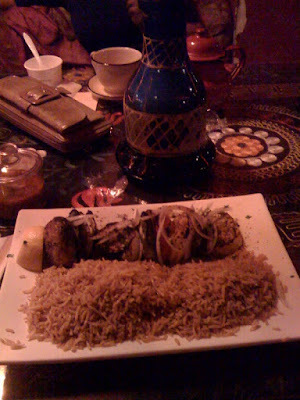 The only bad thing about this restaurant is that they kept playing the same Persian soundtrack over and over again. I love Persian music but a certain track literally played about 16 times while I was there. I love the song but I hate it. Some may know why. Oye. Anyway, the food was wonderful, atmosphere and vibes were so good, seating arrangements are different to say the least LOL. Had great laughs here with a very old friend of mine. Would love to come back here for some more! I have attached the song for comic relief. Enjoy the music video - it is so ridiculously funny! PS. Was a little confused because this restaurant was supposed to be Afghani but almost everything about it was Persian. The only thing Afghani about Khyber Pass was the rice! Nevertheless, cool place. Adorable photos! The girl is so beautiful!